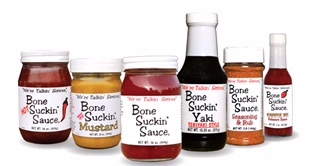 Bone Suckin’ Sauce – 4 Flavors – Original, Hot, Thick, Thick Hot 1st Place Winner Battle of Sauces & Best in Sales in Winner’s Circle. Western North Carolina tomato based sauce sweetened with honey & molasses #1 Newsweek Magazine! A+ Health Magazine for being the best tasting! Best seller in specialty stores, health food stores, grocery stores & restaurants. Paleo Friendly, Non GMO,Gluten Free, NO HFCS, Dairy Free, Kosher. Bone Suckin’ Garlic & Honey Wing Sauce – Smell the aroma of garlic and enjoy the sweet taste of honey while your family devours the chicken wings! Bone Suckin’ Garlic & Honey Wing Sauce will quickly become your favorite! Paleo Friendly, Non GMO,Gluten Free, NO HFCS, Dairy Free, Kosher. Bone Suckin’ Honey & Habanero Wing Sauce – Time for a Wing Eating Competition tonight! The right amount of sweet & heat will quickly make Bone Suckin’® Wing Sauce your favorite! NON GMO, Gluten Free, NO HFCS, Dairy Free, Kosher. Bone Suckin’ Mustard – 2 Flavors 1st Place Winner Great American Barbecue Contest in Kansas City! Bone Suckin’ Mustard is turning the BBQ world upside down because of its great taste & combination of brown sugar, molasses and paprika! In the Sweet Spicy we added the right amount of jalapeños! NON GMO, Gluten Free, NO HFCS, Dairy Free, Kosher. Bone Suckin’ Hiccuppin’ Hot Sauce – 1st Place at the Fiery Food Challenge, the most coveted honor in the industry for ultimate Heat & Flavor! Made from the powder of one of the most flavorful hot peppers in the world…the Habanero and then carefully blended with Hot Bone Suckin’ Sauce to get a perfect balance of flavor and heat. It might take your breath away and make you hiccup! Paleo Friendly, Non GMO,Gluten Free, NO HFCS, Dairy Free, Kosher. Bone Suckin’ Yaki – Teriyaki Style – “Nothing beats salmon grilled in a crispy glaze of Bone Suckin’ Yaki.”… House & Garden Magazine. “#1 Teriyaki”… New York Daily News. Richer in flavor than traditional teriyaki and lower in sodium and has a hint of garlic. NON GMO, Gluten Free, NO HFCS, Dairy Free, Kosher. Bone Suckin’® Sauce CAJUN Seasoning & Rub 4.2 oz. – Bone Suckin’ Cajun Seasoning is the perfect blend of spices & herbs along with the right amount of heat. It makes your food taste great, gets friends talking & coming back for more! Use generously & your Cajun food will be “Bone Suckin’ Good!” Use On: Seafood, Poultry, Steaks, Pork, Pasta, French Fries, Rice, Vegetables, Gumbos & more! Paleo. NON GMO, Gluten Free, Dairy Free, Kosher. Bone Suckin’® Sauce LEMON PEPPER Seasoning & Rub 7 oz. – Everyone LOVES Lemon Pepper! Guaranteed to make your chicken, soups, seafood & more come alive with the perfect blend of citrus & pepper. Your meal will be “Bone Suckin’ Good!” USE ON: Chicken • Seafood • Pasta • Shrimp • Tilapia • Salmon • Wings • Asparagus • Clams • Burgers • Scallops • Steaks • Pork. Dairy Free, Non GMO, Gluten Free, Kosher. Bone Suckin’® Sauce STEAK Seasoning & Rub 5.8 oz. & 26 oz. – Good Grilling recipes come from backyard cookouts with good friends.” This was the inspiration for our new Bone Suckin’ Steak Seasoning & Rub. Our unique blend of spices and herbs will make the most savory steaks you’ve ever had! Turn your Home into a Steak House! Super Easy – Rub seasoning on Steaks, place steaks on grill and enjoy the compliments. Versatile enough to be used on just about anything – Try it on Potatoes! Paleo. Dairy Free, Non GMO, Gluten Free, Kosher. Bone Suckin’® Sauce CHICKEN Seasoning & Rub 5.8 oz. – Garlic and sage come to the forefront of our Bone Suckin’ Chicken Seasoning and compliment the hints of the celery and citric Flavors. While it’s the perfect mouth watering Flavor on chicken, turkey, and other poultry it’s versatile enough to be used on just about anything. Dairy Free, Non GMO, Gluten Free, Kosher. Bone Suckin’® Sauce Seasoning & Rub 5.8 oz. & 26 oz. – You will wonder how you ever lived without it! Our Original Seasoning & Rub is a proprietary blend of brown sugar, paprika, garlic and spices that is perfect for marinating and BBQ – even popcorn and salads. Great on Ribs, Pork, Beef, Chicken, Seafood, Venison, Beans, Pasta, Vegetables, Steaks… just about anything. Dairy Free, Non GMO, Gluten Free, Kosher. Bone Suckin’® Sauce HOT Seasoning & Rub 5.8 oz. – A cayenne kick is the perfect addition to the proprietary blend of brown sugar, paprika, garlic and spices in the original. This perfect combination of spicy, salty and sweet brings just the right amount of heat to this versatile new product. Dairy Free, Non GMO, Gluten Free, Kosher. Bone Suckin’® Sauce SEAFOOD Seasoning & Rub 5.8 oz. – “Born on the North Carolina Coast, our Bone Suckin’ Seafood Seasoning is all you need to add great flavor to your favorite seafood. Use amply for the Bone Suckin’ flavor.” Great on all seafood including salmon, Flounder, trout, mahi-mahi, shrimp and scallops. Also great on vegetables! Dairy Free, Non GMO, Gluten Free, Kosher. Bone Suckin’® Sauce VEGETABLE Seasoning & Rub 5.8 oz. – Our Bone Suckin’ Vegetable Seasoning is perfect for asparagus, potatoes, broccoli, mac & cheese and anything else you can dream up! USE ON: Vegetables, Broccoli, Green Beans, Asparagus, Potatoes, Mac & Cheese, Cabbage, Avocados,Turnip Greens, Corn, Eggplant, Squash, Onions, Mushrooms, Tomatoes, Carrots. Paleo. Dairy Free, Non GMO, Gluten Free, Kosher.